MULTISAR’s Grassland Gazette 2017 is here! 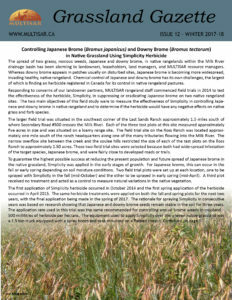 This year’s newsletter features MULTISAR’s efforts to test Simplicity’s (herbicide) effectiveness in controlling Japanese and downey brome, which are both becoming a major threat to native rangelands in southern Alberta. Off-site water developments are also explored in this issue, and learn about one of Alberta’s most endangered plants, Slender Mouse-Ear Cress. Read the complete Grassland Gazette newsletter here!